The GI specialization focuses on remote sensing, data structures and data mining, GIS, and image processing, analysis, and interpretation. The curriculum is designed to prepare professionals who want to specialize in integrating earth imaging with georeferencing. Our GI curriculum is unusual because it is more than an emphasis on GIS applications and develops additional skills beyond a traditional GIS concentration. 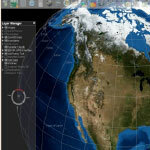 Instead, it uses GIS, IDL/ENVI, and other software to conduct data retrieval and image processing from satellites, radar, LiDAR, and other active and passive remote sensing devices.